Photo credit: Evan Carter/<a href=http://www.evancarterphotography.com" target="_blank">evancarterphotography.com</a>"
embed-2"I am #transformed," it read. Not his last tweet, but close. Six days later, with his unexpected passing now confirmed, that fated message takes on divine significance. But considering the timing of his initial posting, one could easily deduce that Prince was commenting on how renewed he felt after his performance the night before. The Atlanta date wasn't supposed to be his final stop. It was a makeup date scheduled after his bout with the flu a week prior caused him to postpone the original Atlanta stop for his Piano & a Microphone Tour. But, alas, a fan named Jamie Martin uploaded a quality pirated live recording of Prince's final show six days ago. And in light of today's tragic news, it's being passed around online like digital manna from heaven. With a total run time of 1:31:47, it's exactly as advertised: Prince, on a piano, with his microphone. And God, it's glorious. UPDATE 4/22/16: Jamie's Soundcloud post was taken down last night. A new one is now posted below. There are also others floating around for now. *UPDATE 4/22/16 4:20 P.M. The new photo added at the top of the post was taken by photographer Evan Carter, who shared it with CL to accompany the post. 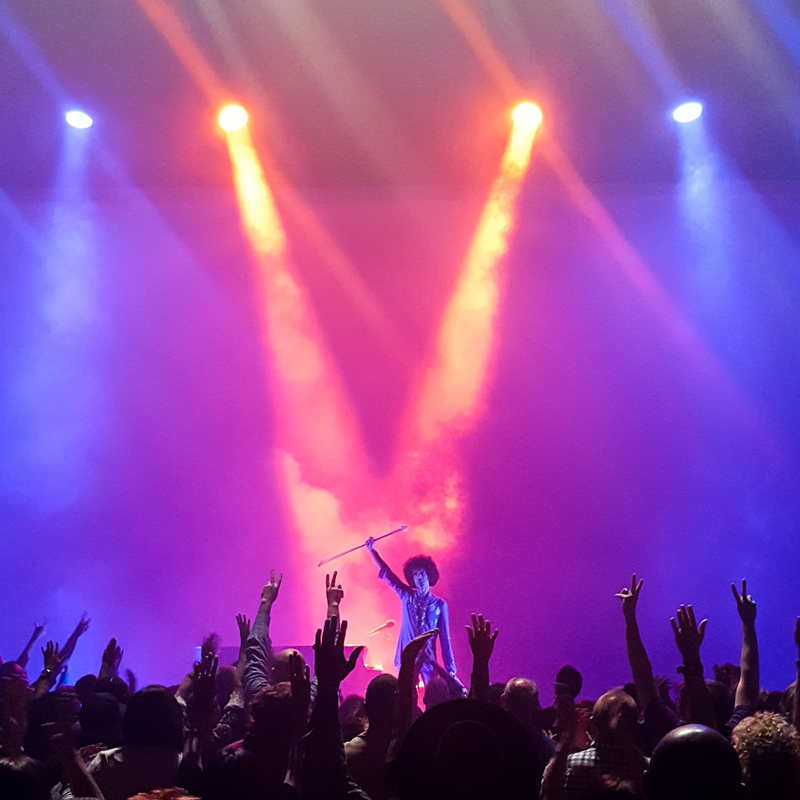 Despite Prince's ban on photography at his concerts, Carter expressed feelings similar to fans who, despite respecting the artist's views against piracy, see the sharing of such items as a way to publicly mourn his death and celebrate his life. "I felt like I was stealing it at the time," Carter said via email. "But at this point I just feel lucky and honored to have been there and to have taken a picture that makes one of my heroes look exactly as I always wanted him to. Never would have imagined it would be one of the last." After coming out to deafening screams and crowd applause, it includes him performing many of the classics spanning his nearly 40-year career, including "I Would Die 4 U," "Baby I'm a Star," "Ballad of Dorothy Parker," "Dirty Mind" (in the middle of which he breaks into a riff of the theme from "Peanuts" aka "Lucy and Linus" by Vince Guaraldi), "Nothing Compares to U," "Cream," "Black Muse," "How Come U Don't Call Me Anymore?" "If I Was Your Girlfriend," "Sometimes it Snows in April," "Purple Rain," "Diamonds and Pearls," and plenty more (I'm still listening as I type this and only about two-thirds of the way through so far). Prince was always in rare form and this is no different. But given the size of the Fox and the parameters of the show — a piano and a microphone — fans got a much more intimate and personal performance from the Purple One. He banters back and forth with the crowd between and even during songs. His energy is high and his humorous wit as sharp as ever as he jokes and makes fun of the crowd. "He started the concert with an apology. He said he was sorry for canceling the week before. But he gave an incredible performance with at least four encores. There was a tiny bit of gravel in his voice from time to time, but that was the only indication that he'd felt ill the week before." "He left everything on the stage, like he always did. After one song, he got up and left the stage because he was overcome by emotion. Honestly, it's too much for me to take in at this point." "He performed at the height of his powers, but he always did that. That's one of the things that made him great. Very few artists could sit at the piano and totally kill a concert using just that instrument and the power of his voice. He was that kind of master. He had the entire audience in the palm of his hand." It's a true testament to the most prolific pop icon of the last quarter of the twentieth century. Listen now before it disappears.